Our congregation is among others in the Twin Cities invited through Isaiah Minnesota to prepare to provide Sanctuary to undocumented people facing threats of detention and deportation. When this call came to us in late November, issued by organizers in local immigrant communities, our Lead Minister and Board unanimously said yes. We are ready to welcome an individual, couple or family to take refuge here, mindful that neither they nor we can know how long they will need to stay. We understand this to be at once a symbolic action and a practical one. In the past, congregations have been among the public spaces regarded by law enforcement as “sensitive locations,” where those threatened by detention have often been more safe from arrests and raids. We are ready to offer this protection. At the same time, we know that no church sanctuary can guarantee safety, despite our intentions, our strong community partnerships and the best efforts of supportive legal advisors. We understand Sanctuary to be an act of public resistance on the part of those taking shelter and those providing it. Acting in concert with many others in our state and across the nation, and taking the lead from communities most directly affected, we are saying no to unjust policy. This is an act of prophetic witness as well as a tangible project. calls the human family a beloved community, bound within an interdependent web of sacred existence. In humility, we acknowledge the roots of this call in a long tradition of faithful witness, from the courage of abolitionist Universalists and Unitarians in the 19th century, to the integrity of those in the mid-20th century who risked all to rescue refugees from fascism and Nazism. This tradition of loving resistance and inclusion extends to our own time, when our congregation has led with clarity and courage to defend the lives and the rights of gay, lesbian, bisexual, transgender and queer people, resisting every impediment to marriage equality and universal protection, including the refusal for more than a decade to comply with “separate and unequal” marriage license laws. In recent years, in response to oppressive immigration policies, our congregation formed an Immigration Task Force, taking part in weekly interfaith vigils at the Ramsey County Detention Center, collecting clothing and supplies for migrants in the desert, supporting the work of No More Deaths and other UU and interfaith agencies on the border, taking part in Justice General Assembly in Phoenix in 2012, and holding classes and presentations before and after our Minister’s journeys to Arizona and Mexico with the UUA’s College of Social Justice in 2011 and 2014. Sanctuary is a non-violent, religious response to federal policies of exclusion, racism and cruelty. Although our nation’s immigration policy has been broken for a long time, and although more people with undocumented status have been detained and deported in the last eight years than under any prior Administration, the current Administration has already ushered in an era of unprecedented oppression, terror and danger, from the promise of millions of new deportations, to the expansion of the powers and scope of immigration agencies and local law enforcement, to the threats to families and young people (currently protected under DACA), to the promise of an extended border wall. In response, and in faithful partnership and solidarity with other communities of faith, we renew our intention to stand, with hope and courage, on the side of love. Our hope is that as our congregation takes up this particular work, we will also renew our commitment to understanding and working to change unjust immigration laws; to acknowledging and working to dismantle our own racism, and to following the lead of communities of color. 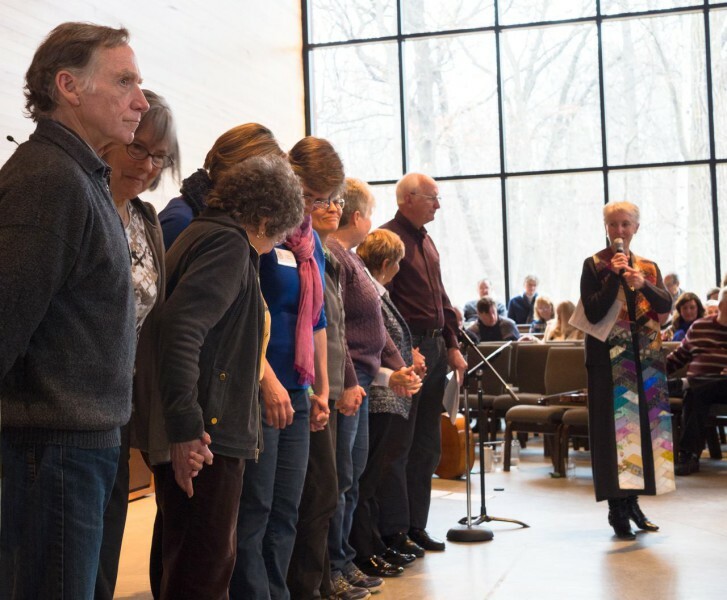 We understand that we may be called to support other congregations in their commitment to Sanctuary, and that in the days and weeks ahead we may be called to additional acts of solidarity and courage. We are a Sanctuary Church.